我的孩子们都不爱吃别人煮的南瓜饭。原因是” 南瓜软扒扒, 不香又 geli。” 饭中的南瓜我用炸的方式所以特别香甜可口,也不带” 南瓜味” 不太敢吃南瓜的儿子也一直找南瓜呢! 一大早我家厨房弥漫了咖喱及虾的混合香气, neighbour 一定很羡慕我吧, 哈哈!! This year our family decides to celebrate Halloween simple. Few days ago my daughter told me that she feels like eating curry flavored dishes. 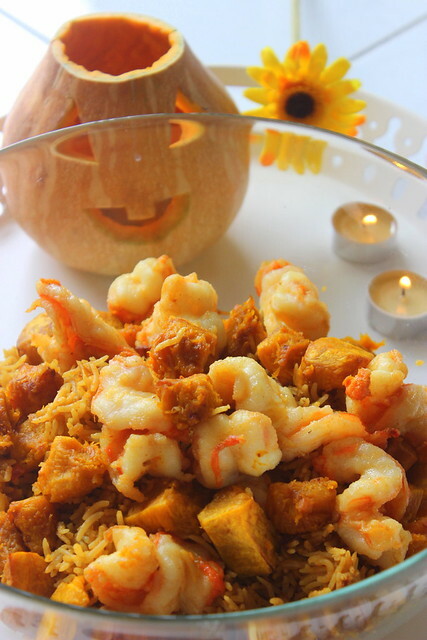 This pumpkin and prawn curry rice is a one dish meal. Its cooking method is simple, delicious, rich, and awesome. 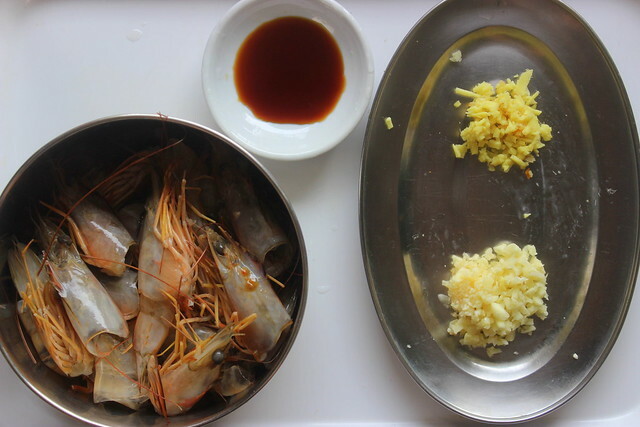 Using prawn broth to cook this meal with just the right hint of curry flavor accompanied by fresh and delicious big prawns, my children just couldn’t stop eating! This year’s pumpkin is carved by my husband. It looks a bit strange because it is not fierce enough but we still give him a thumbs up. 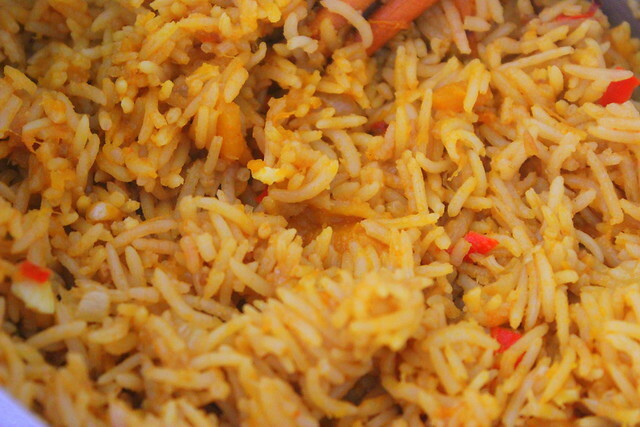 Truth is, my children don’t eat pumpkin rice cooked by others. Reason being the pumpkin is usually too soft, not fragrant, and geli. 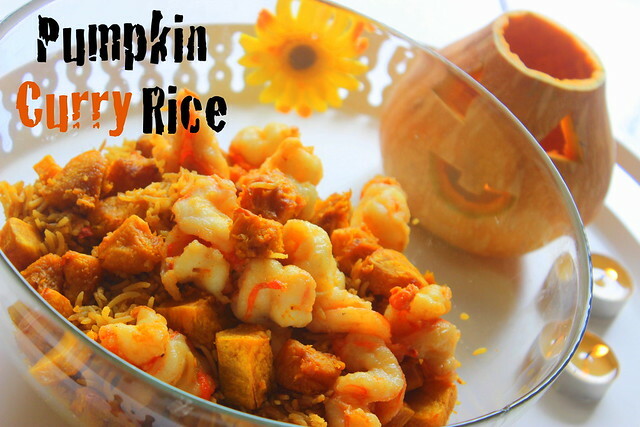 i use deep fry method for the pumpkin in this rice so that it is especially fragrant, sweet, tasty, and has absolutely no rawness left in it. Even my son who doesn’t favor pumpkin keeps searching for it! 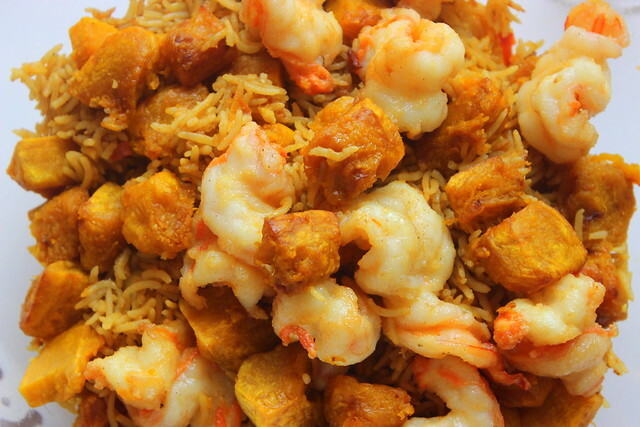 That early morning my kitchen was filled with the marriage of aroma between curry and prawns. My neighbor must be very envious of us, haha!! Heat up 1T oil. Stir fry prawn heads & shells till they turn red. Add in garlic & ginger. Fry till fragrant. Add 3T cooking wine & soy sauce. Add in 3 & a 1/2 to 4 cups water. Simmer for 5 to 8 minutes. Drain & reserve stock. Heat up 2T oil. Saute bombay onions till soft. Add in garlic, chopped chili, & tomatoes. Stir fry for about 1 minute. Lower the heat & add in curry powder. Add rice & rice seasoning. Mix well & pour into a rice cooker. Bring prawn stock to a boil. Pour into rice cooker. Cook. Heat up 2 cups of oil. 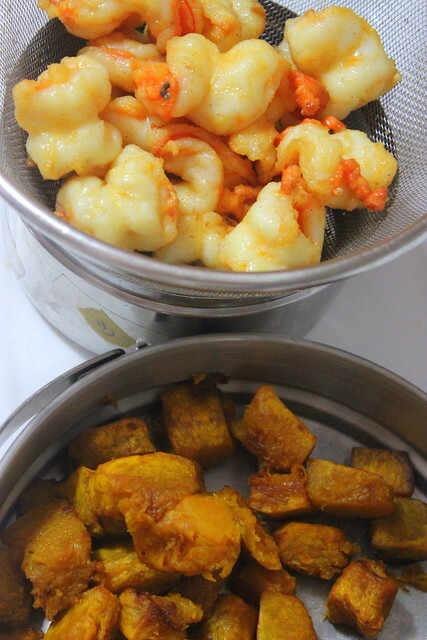 Deep fry pumpkin cubes for 4 – 5 minutes / until cooked. Drain & lightly sprinkle with salt. 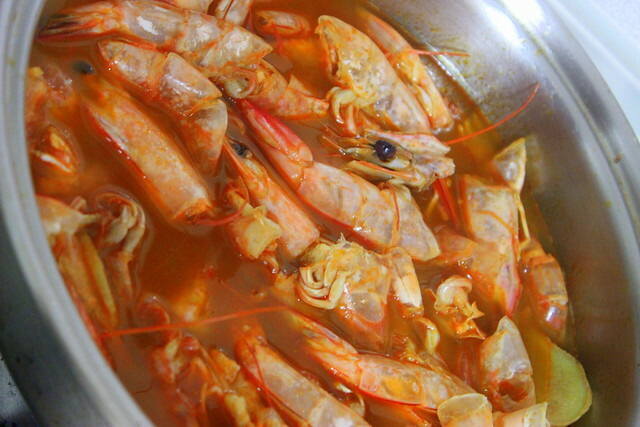 Deep fry prawn for 2 – 3 minutes. Remove. To assemble, loosen up cooked rice. 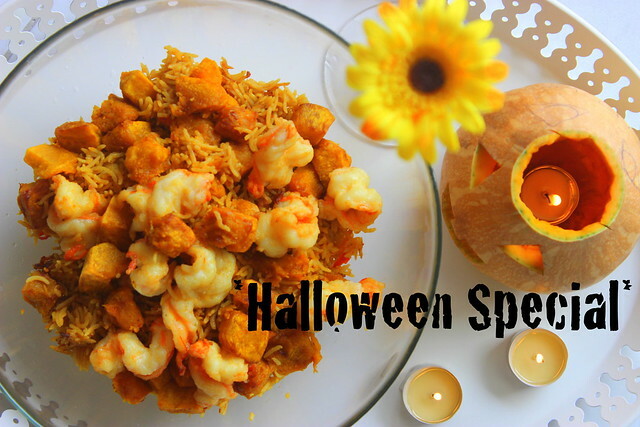 Mix rice, pumpkin, & prawns together. 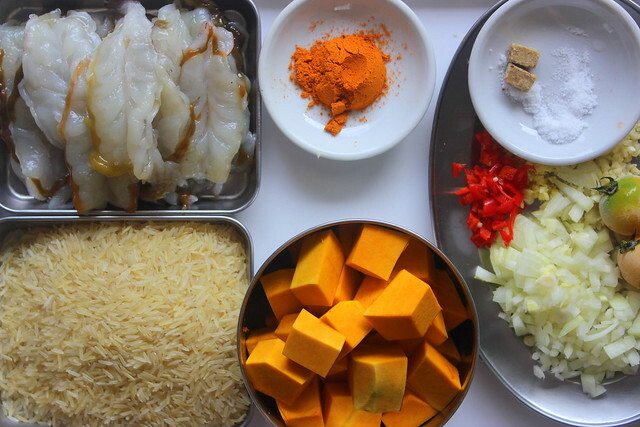 Thanks for the lovely recipe, I loved pumpkin and am going to try it out this weekend. Erm, pardon my silly question, when the ingredient says: 1 T … it means 1 Tablespoon right? hi RO, my pleasure to share this (: your question is not silly at all & yes, you are right – capital T stands for Tablespoon, while small t is teaspoon. good luck & Happy Halloween!! i modified it to the vegetarian version and dumped the pumpkin in! (oh and sans the chilies and garlic as my fiance cant take too much chilies) it was soooo nice! sweet,fragrant,and abit spicy, such an interesting twist to the range of all-in-a-pot dishes!